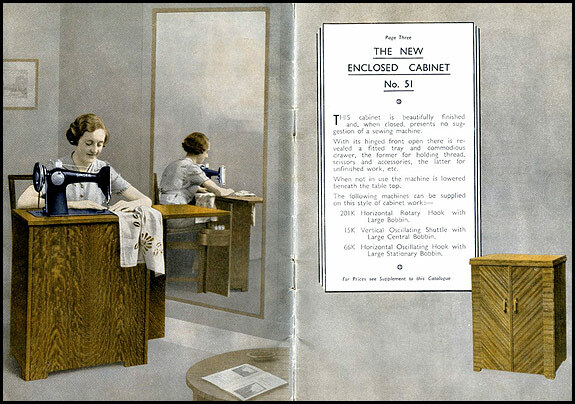 I’m not sure when the No.51 Cabinet was introduced, but it certainly wasn’t long before the start of the 1939-45 war. Whenever, we like it lots because it’s both compact and very practical, and we usually have at least one of these in good condition listed on the Singers for sale page. 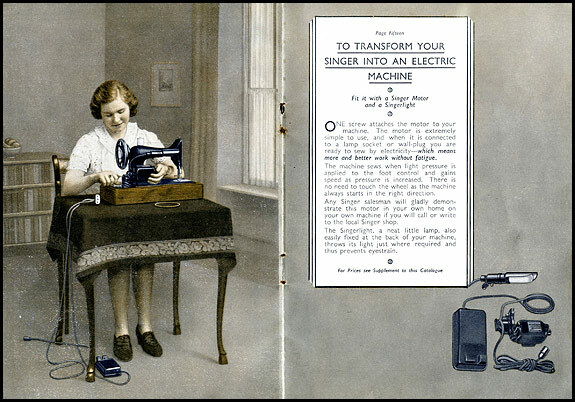 It takes any full-size vintage Singer, the treadle mechanism works a treat, and it can be supplied as it could when new with the option to switch easily from treadle to electric power as the fancy (or the power cut) takes you. We often have one of these available too! 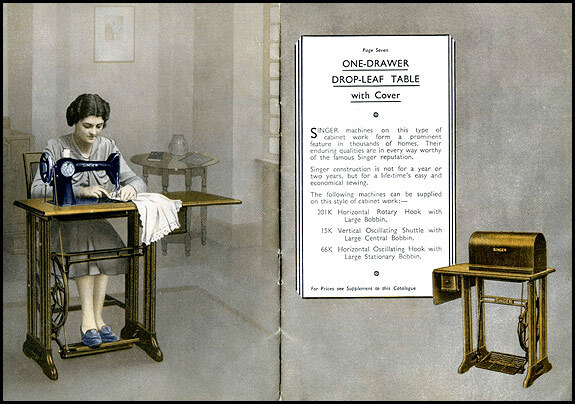 This is the standard treadle base which replaced the ornate cast-iron one, and it was available with either three or five drawers. If it looks to you more like two drawers or four, that’s because Singer always counted the wide central tilt-to-open bit which runs across the front between the side drawers as a drawer. Which I guess it is, kind of. I don’t know quite how popular the one drawer table with the bentwood cover was, but you don’t see many of them nowadays. 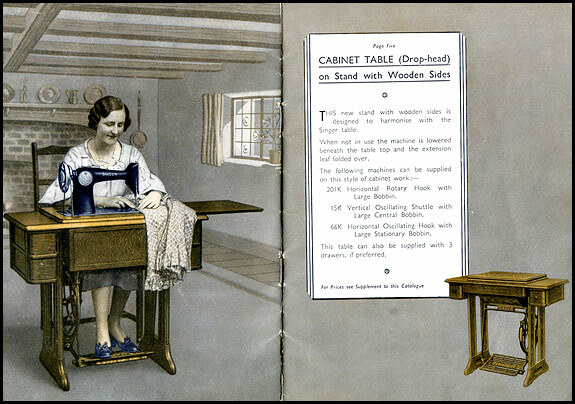 I could see the point if you could drop your portable into that table top, faff about a bit and start treadling, but you couldn’t, so maybe the idea was to use up a vast stock of bentwood case tops prior to the changeover to suitcase-type cases? The No.40’s not at all common nowadays, though you do see them from time to time – often in the sort of rooms which still have a dusky pink Dralon sofa, a Bontempi organ and a print of Tretchikoff’s “Blue Lady” on the wall. What’s far more common is the later, modern version – particularly the one which takes a 99 rather than a full-size machine. This is one of the many things which puzzle me about vintage Singers – why did they run the 201K2 (potted motor) alongside the 201K3 (belt-drive motor)? I’d love to know what the sales pitch was! 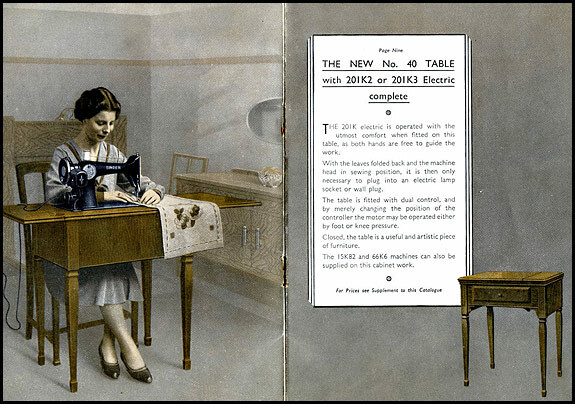 Note that these electrics are knee-levers, which apparently sold well for years despite the somewhat agricultural appearance of the knee-lever itself. Here’s the old faithful 99, which they were still making the best part of 20 years after this brochure was printed. Note that it’s no longer in a bentwood case, and that you could rent one or have one on free trial. 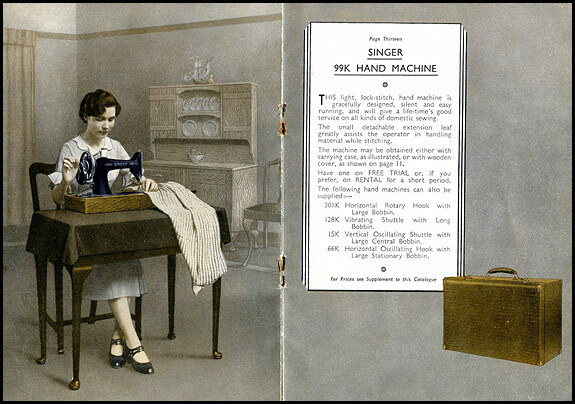 Have you noticed how in those days you always sewed with your right leg crossed over your left? 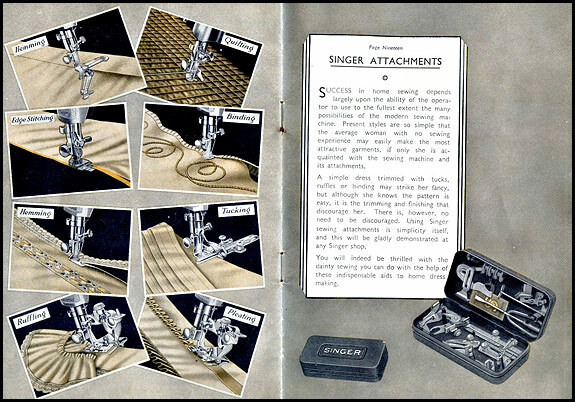 “Any Singer salesman will gladly demonstrate this motor in your own home on your own machine if you will call or write to the local Singer shop.” I’ll bet – and no doubt talk you into part-exchanging your old 27 for a nice new 201 while he’s at it. Note that apparently you don’t cross your legs whilst fitting a motor. 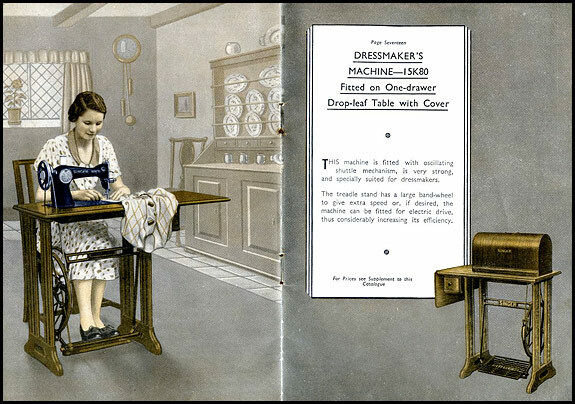 This is a rare bird nowadays – a 15K on what’s often referred to as the “artisan” treadle base. This is the base with the bigger-diameter treadle wheel for faster sewing, which I think evolved into the one with the knee-lever presser-foot lift used for the 1200. And you don’t see many of those either! 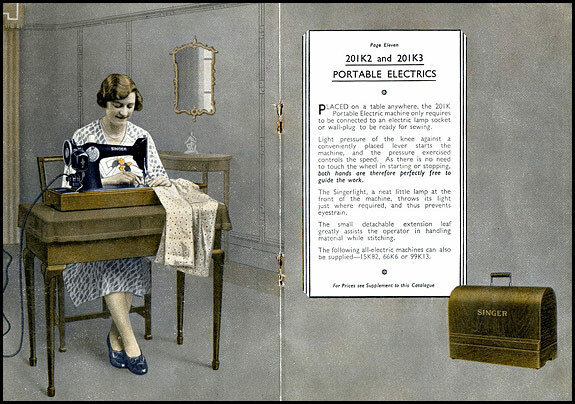 The standard attachments are shown in this brochure in the black crinkle-finish “godzilla” tin, which raises the question as to which machines were sold with them in the cardboard box instead? I have no idea, but I do know that we can usually supply full sets in either. 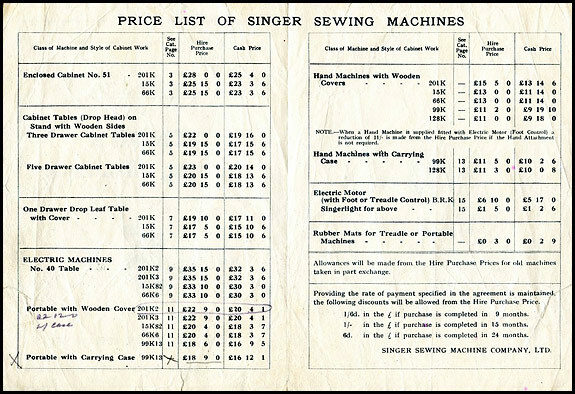 Now if this isn’t actually the 1940 price list, believe me it’s as good as. By this time they’ve moved on from quoting “list price” and “net cash price” to the much less confusing “hire purchase price” and “cash price”, but still with the discount for early settlement. It’s difficult to give present-day equivalent costs because it all depends on how you do the calculations, but if we take for example a bog-standard 66 in a 5-drawer cabinet table, that’s listed here at £18 13s 6d cash or for our younger readers £18.67. If we go by the Retail Price Index, that’s £795 today, but if we use instead average wage values, it would cost you £2370. Either way, it just goes to show that these things were never cheap – and that buying a good one now is a real bargain!